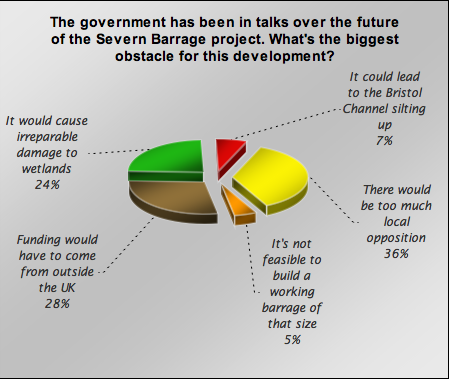 Last week’s poll: what are the obstacles to building a Severn Barrage? The government has been in talks over the future of the Severn Barrage project. What’s the biggest obstacle for this development? The largest group of respondents to last week’s survey, 36 per cent, said that public opinion would be the biggest obstacle to building a hydroelectric barrage across the Severn Estuary. The next largest group, 28 per cent, raised finance as the biggest obstacle, while environmental concerns, such as the threat to nearby wetlands, was selected by 23 per cent. The prospect of the silting-up of the commercially vital Bristol Channel concerned 7 per cent, while only 5 per cent believed that technical difficulties presented the biggest problem. What’s your view of this issue? Why might local people object to the project? Is current technology really sufficient to make the most of the Severn’s tidal range? Let us know below. It is extremely important that we go for this and similar schemes as it will be a reliable source of renewable power (powered by the pull of the moon, which is unlikely to fail!). Expensive, yes, but worth it. It is by far the best solution for energy. The sea rises and falls daily at zero cost with 100% reliability. If this will give 5% of our total energy needs it to other estuarys such as the Thames, Tyne, Wear and others wherever economically possible. at times our leaders need to do whats best for all the people not just, will we get in next time. be bold. do it. the birds will find another place. Tidal power is predicatable and reliable, unlike wind. Harvesting tidal energy is difficult. A barrage is an ulgy way to do it. How about more investment in underwater turbines? The impact on the environment would be less. Already had my say on this…..
What’s happened to the link to the London Airport issue.. This is an important green energy supply for society. The birds can fly, which is why they survived the dinosaurs. The alternative of global warming may be a worse option for the birds & society. Would objectors like a nuclear plant in their back yard? I don’t understand why they did not combine the Severn bridge with a means of producing power at the same time. Surely someone could design a bridge and combined energy in one. As with any substantively new project there will be associated effects and impacts, be they on silting, wildlife or other issues. The benefits appear to substantially outweigh the problems, and this needs to be sold effectively to all interested parties. However, the biggest problem in view is that of when – will someone actually bite the bullet and give this project the go-ahead before we start having brown-outs? As a closing point, I would favour underwater turbines as opposed to a barrier, if this can be shown to be as effective. Yet another energy scheme that has a lot of steel and concrete just to move those tiny electrons out or their orbitals; we are in the nano century, this idea is from the last century. This collosal waste of money is only being considered because Tony Blair signed up to cut the UKs carbon emissions by an unachievable amount. To generate the same amount of unreliabe Power as a single dependable Nuclear PS at 10 time the cost is the economics of the mad house. In addition, Tony Blair also signed up with the EU to protect Wetlands. How much would be be fined by the EU if we fail to do so? Is this included in the costs of the Barrarge? Wildlife will adapt. One only has to watch birds of prey hunting on motorway central reservations to prove that animals can make a living virtually anywhere. Projects like this should not be delayed. What ever the scheme public inquiries put up the eventual build cost many times. This is not to say that some considerable care should be taken to limit the impact of the environmental change in such a project. Regards.